My Easter decoration efforts make me happy. I love the colours and figures of Easter. The Easter twigs (of birch tree) is a Swedish tradition that I ♥, especially this year when it was snowing outside. Then we bring spring around anyway, and it bursts into bloom indoors. I love that we celebrate with little silly chickens all around. Happiness! I hope your Easter was filled with chickens and eggs too! 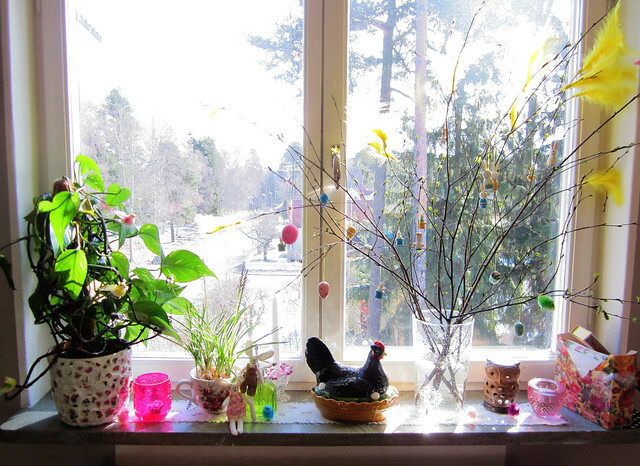 This entry was posted in Home Comforts and tagged easter, happiness, in my home, traditions, window view. Bookmark the permalink. 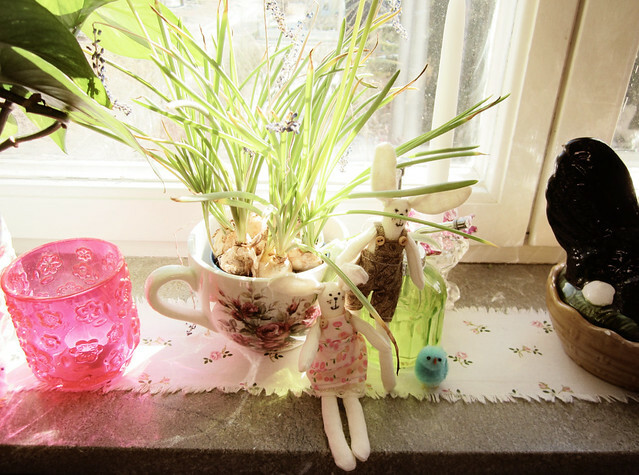 Your Easter decorations made me happy too. I put lots up too…. (I put pics on my blog too!) – I’m not ready to take them down yet! I especially love the sweet yellow feathers! 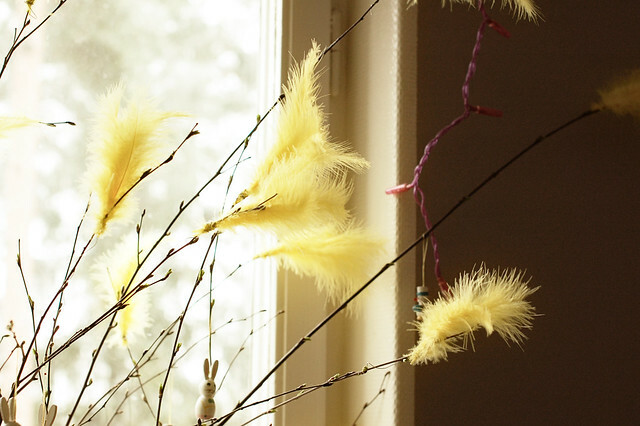 I love those Easter branches that bloom inside… yes, we do that with Easter too. The little blossems held the promise of sunshine, no matter what weather it is outside. 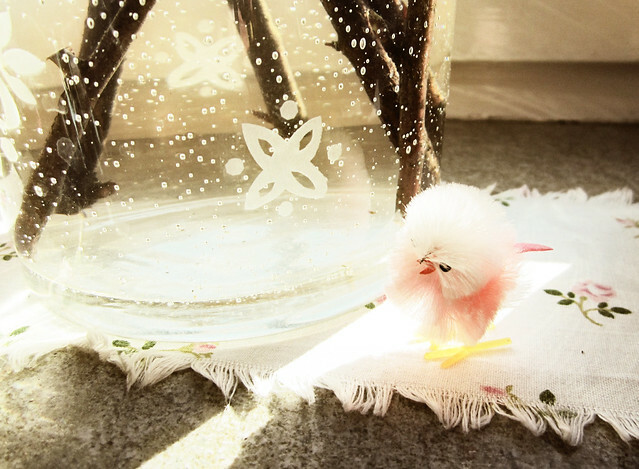 Your Easter decorations are cute! 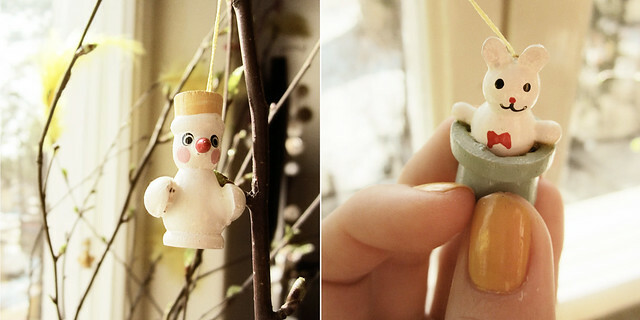 I love little wooden ornaments! For Easter, Christmas whathave you! I LOVE them! Tooo fun! Love the Easter decs – i used to do this when my children were small but don’t do it now – you have inspired me to revive the tradition! Your post card swap has caught the imagination of my 4 year old grandaughter – she has already made and sent 3 cards, I have pictured her latest one on our blog. Lovely and sweet spring time treats ! I created an Easter Tree with my neice and nephew this year. It was full of creatures and eggs that we created together. Love that ! I hope you and your loved ones have a wonderful Spring, Hanna! I bet your apartment looks awesome. I had a lovely Easter but not one Peep! I usually have Peeps EVERYWHERE! !